Many users who have upgraded from XP to Windows 7 are facing problems to switch XP backup to Windows 7. This problem occurs because Win 7 has their own integrated backup tools that do not support restoring backup files of older version of Windows. In spite when users try to restore XP BKF files on Windows 7, they encountered with error messages like "The Backup File Contains Unrecognized Data & Cannot Be Used". As well as virus infection, BKF Data interruption also media file error etc. Also there are certain situations where users face BKF file corruption while restoring XP backup file in Win 7. Corruption & inaccessibility both of these issues are really annoying. Well in order to avoid all such situations & draw best results out of corrupt backup files we have proficient BKF Repair Tool. However, the situation may be any but BKF recovery tool is one of the best tools that help to restore data from backup file and also to switch backup from XP to Windows 7 effectively. The tool is capable in restoring data even from those BKF file that displays error messages. 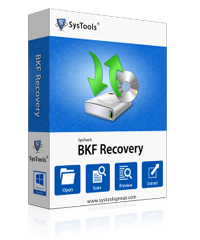 BKF recovery software also supports recovery of backup file of any size without any kind of issues. The software also offers recovery of selective data from corrupt Backup files by checking and unchecking the folders which should be extracted from .bkf file. Quick Scan: The scanning mode embedded within tool is helpful to those users who have minor corruption in backup file and needs to extract BKF file data quickly. The tool will perform quick scanning of Backup files and previews all contents of BKF file without consuming much time of user. Deep Scan: Via this option users can perform a deep scanning of highly corrupted BKF files. The software will perform a deep scanning of BKF file and views all the contents with all necessary details to users. Range based Scan: The tool to switch Windows XP to Windows 7 also offers special option for users want to scan a particular portion of Backup file by providing a defined range to software interface. The BKF recovery tool also provides options either to extract restored BKF file data at its original location or to extract at location of users own choice. Users can choose the desirable location for saving Backup data into system. These options are mostly useful in cases where users are restoring backup of older versions of BKF file into any other version of Windows.